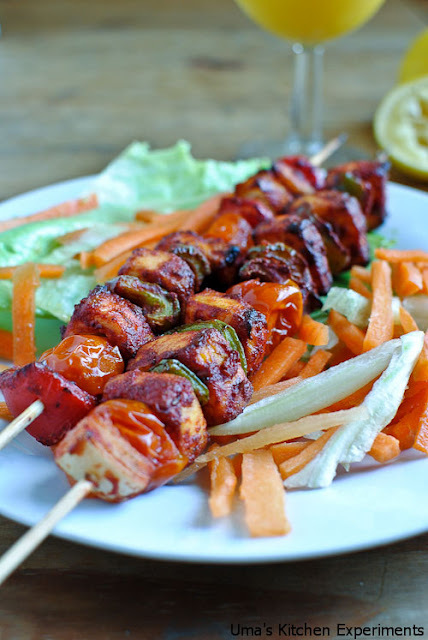 A colourful dish which induces everyone taste buds irrespective of age is Paneer Tikka Skewers. It serves as a very good appetizer. 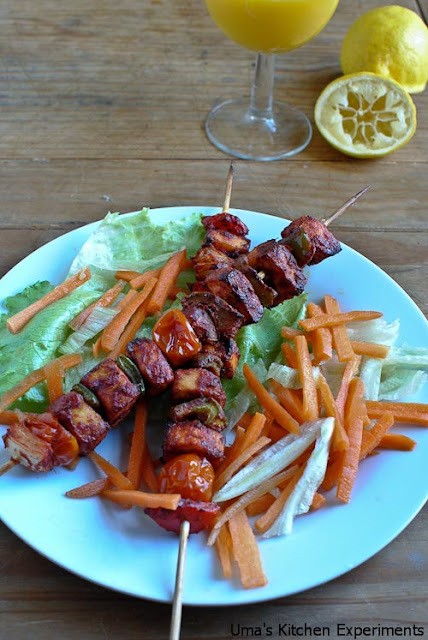 You can prepare this recipe using oven, grill and BBQ. I prepared this dish using oven and it turned out to be delicious. Coriander leaves - 7 strings or 1/2 cup loosely packed. 1) Soak the bamboo skewer (thin pointed bamboo stick) overnight in water or at least for an hour. 2) Grind ginger, garlic, Cumin seeds, Coriander leaves, Mint leaves and a tablespoon of curd to a very fine paste. Don't add water. 3) Add this ground paste with curd. 4) Also add red chilli powder, salt and ajwain seeds. Mix well until you get the fine thick paste for marinating. 5) Dip the paneer in the Curd mixture and toss it well to coat the curd masala with the paneer. 6) Cover it using a lid and keep them marinated for a whole night. If not whole night then at least for half an hour in refrigerator as per your convenience. 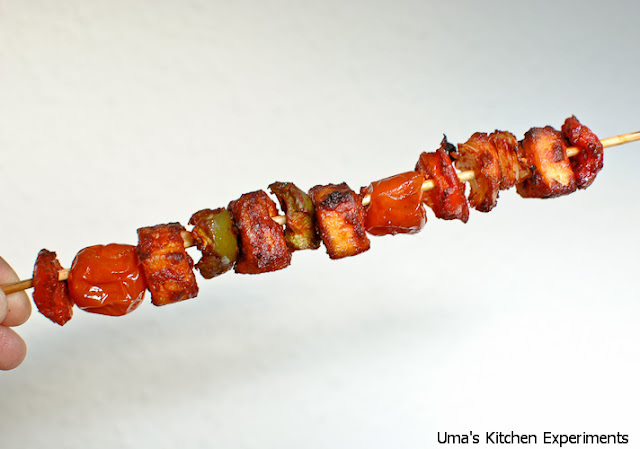 7) Now, take the skewer, insert capsicum, onion, tomato and paneer one by one as shown in the picture till the skewer is filled. 8) Preheat the oven to 250 C and keep the paneer skewers inside the oven. 9) Bake them for 20 minutes or till the paneer turns slightly golden brown in colour. 10) Sprinkle chat masala and lemon juice on the top and serve it hot. 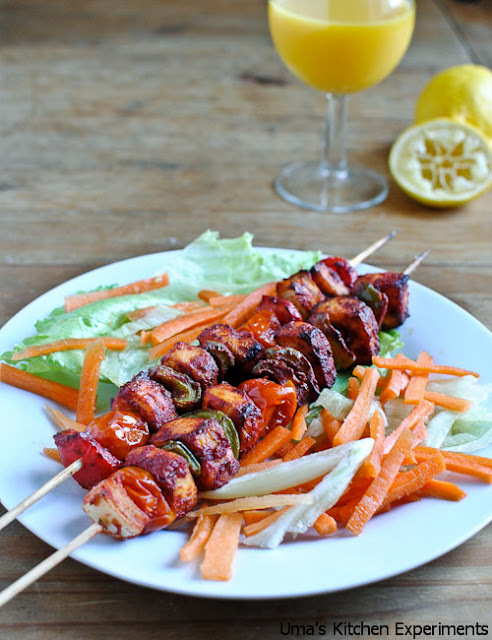 1) I prepared 8 skewer using the ingredients given. You can increase or decrease quantity for all the ingredients according to your taste/convenient. omg i can finish the entire set..